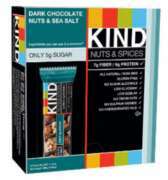 Founded in 2004, KIND Healthy Snacks began with just 8 bar varieties. Today, there are 22 KIND bars with more recipes being perfected for the future. We offer a variety of KIND Nuts & Spices, Fruit & Nut, and PLUS bars in boxes of 12. Order today and do something KIND!